Their name might say basic, but I promise you that the designs offered on Basic Invite are anything but. Stunning is the word that comes to mind, because their designs are breathtaking. There are numerous reasons to fall in love with them, but their design offerings top the list. You can pick from photo designs, non photos, foil, real wood (yes you read that right), black tie, the options are endless. And so are the colors; with over 180 color options you can truly customize any invitation, card or piece of stationery and it will be uniquely yours. You get an instant preview online every time you make a selection. 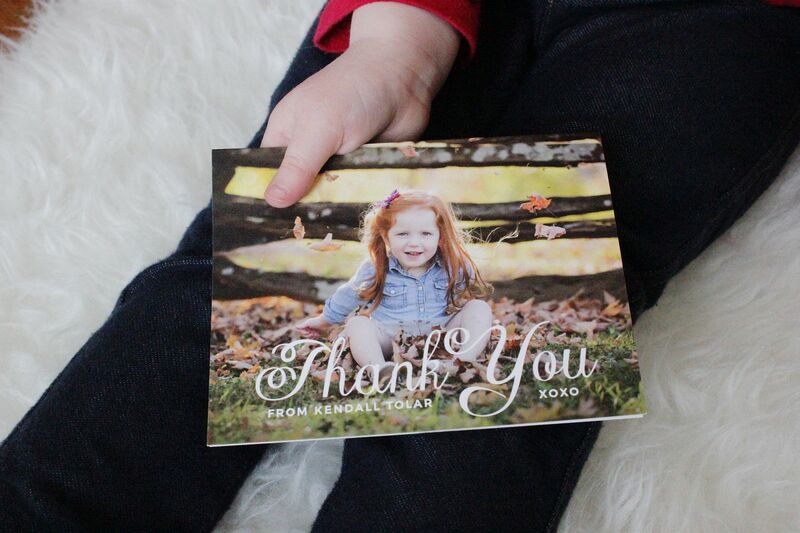 We picked out these adorable and completely customizable thank you cards for our Kendall. 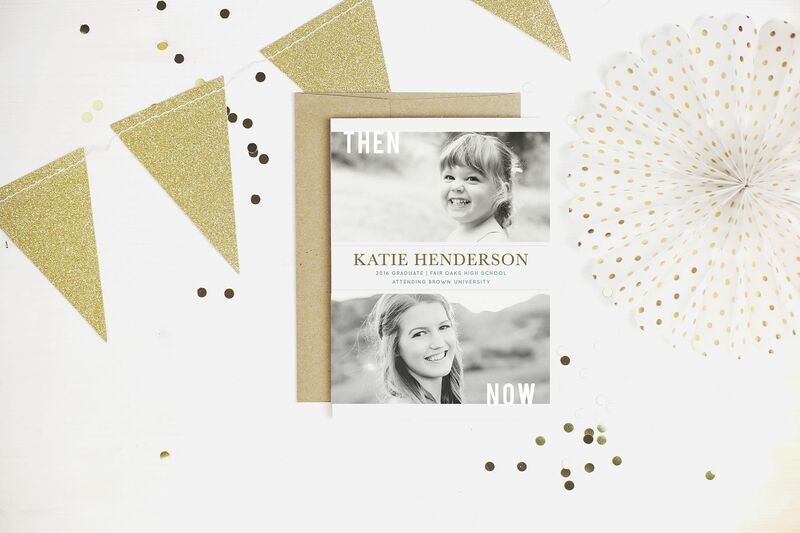 Because every girl needs her own personalized stationery, am I right?!? 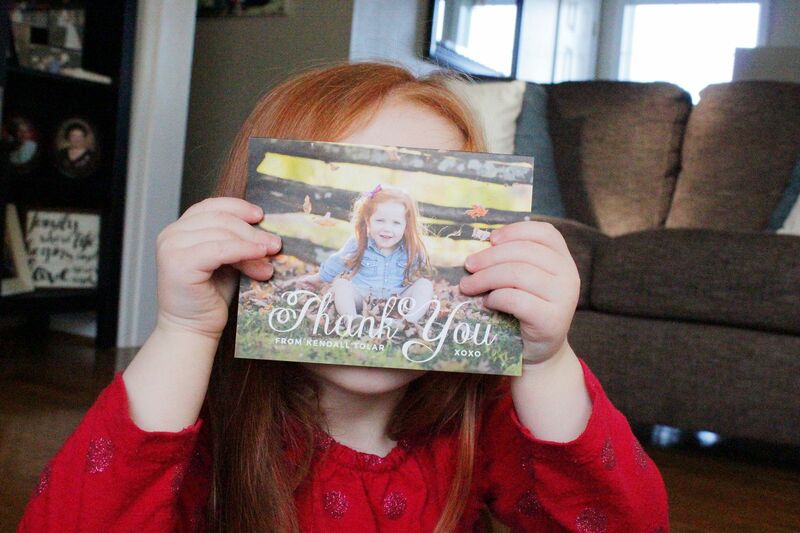 I think photo cards are adorable and we certainly hope our family and friends smile when they open these cards from Kendall. She thought it was pretty neat that the cards had her picture on them ("its a picture of me!"). The process to customize the card was so easy. Basic Invite walks you through every single thing; offering you options on text, font, color, photo, paper. They have incredible fonts and everything looks gorgeous. They even have an option to upload your mailing list and they will print names and addresses for you! I love that feature - saving this busy mama a lot of time! 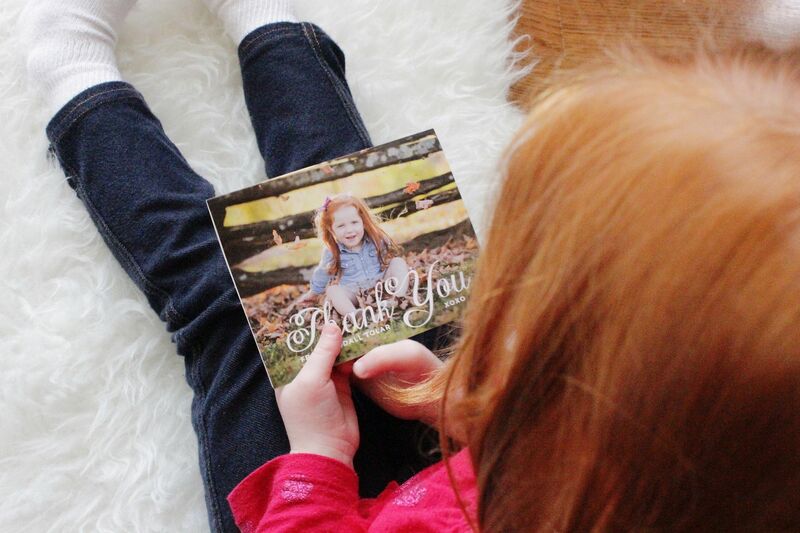 To order your own custom thank you cards, check out their site now. And my most favorite feature of Basic Invite? Peel and seal envelopes!!! I just licked our holiday cards by myself (all 100 of them) and the taste left on my tongue was absolutely awful. I wish I had found Basic Invite prior to ordering our holiday cards just for the simple fact that their envelopes are awesome. I will continue to order from Basic Invite for this feature alone. They also offer you the option to request a hard copy sample of what you create. This is a terrific feature for anyone who wants to order their wedding invitations through Basic Invite. 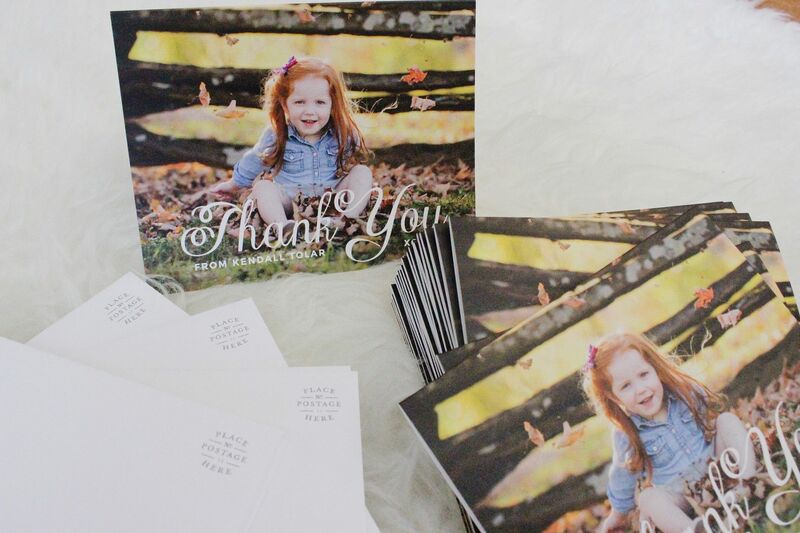 That way you can see (and feel) exactly how your invitation will look before sending it out to your loved ones. And with graduations on the horizon, I highly suggest that you check out their assortment of graduation announcements. I want to graduate again just so I can order this before and after announcement (we did NOT have these gorgeous announcements when I graduated back in the day). 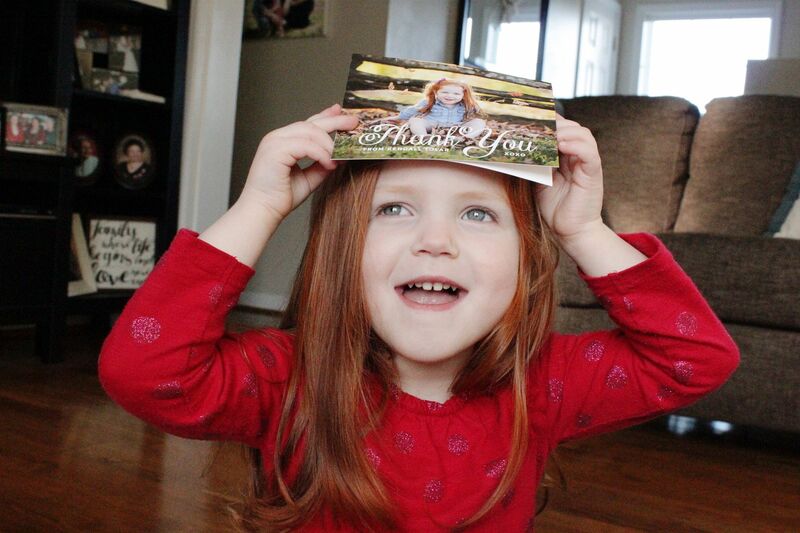 If you haven't sent out your thank you cards for Christmas yet, be sure to order some custom thank you cards now. Your family will love them! And so will you! Thank you Basic Invite for sponsoring this post! The cards turn out great. I plan on doing personal card this year for Christmas.